Here at DeansCards.com, we have been lucky enough to see several dozen T207 baseball cards come through our doors. The T207 set, also commonly known as the brown background set, was manufactured by the tobacco industry giant, the American Tobacco Company, in 1912. Shortly after this set was printed, the American Tobacco Company would be dissolved due to a monopoly on tobacco. There are several different backs that can be found on the T207 baseball cards. The most common is the Recruit back. We have several empty Recruit cigarette boxes in inventory now that are significantly smaller than modern day cigarette packs. Blank or anonymous backs are also somewhat common, depending on the factory number. Cycle, Broadleaf, and Napoleon are also rare backs that command a significantly higher price than the Recruit backs. The most expensive back is the Red Cross back, which was unknown to exist until a few years ago when a large lot of the cards were found. A few Mello-Mint backs, which take up the entire back of the cards, have also been discovered. The T207 baseball cards measure 1½” by 2-5/8”. There are 200 cards total, six of which have variations that range from differences in cap color to the wrong back. One important aspect of the T207 set is that there are no major stars. However, that does not mean that there are not expensive cards within this set. Card #105 Irving Lewis has an A and B variation and both have very low populations. The A variation shows the original Boston Braves logo, while the B variation does not have a logo on his sleeve. Card #112 Louis Lowdermilk is the most expensive card in the set. Lowdermilk played only two years in the major leagues as a pitcher for the St. Louis Cardinals. Buck Weaver, one of the key players in the Black Sox scandal, is another expensive card in this set. DeansCards.com is always looking to buy T207 baseball cards. 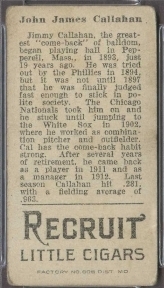 If you are interested in selling T207 cards or any Pre-War baseball cards, please click here. If you would like to view our current inventory of T207 baseball cards, please click here.